1:    <af:selectOneChoice label="Available Printers" partialTriggers="cb1"
What is the default printer ? Usually there is a default printer defined. That is the one I want to use by default in this application. For that to work I need to get hold of the default printer defined. This can be found by invoking lookupDefaultPrintService(). If no printer is selected yet in the ADF Application, I use the default printer. I need to make an adjustment to the getter of the selected printer to return the default printer. Final requirement for the print startup form is to be able to reset the selected printer to the default if another printer was selected previously. For that I use a CommandButton that invokes an actionListener where I simply set the currently selected printer to be the default printer. By using this button, the default printer will be selected again. Now what about the actual printing ? 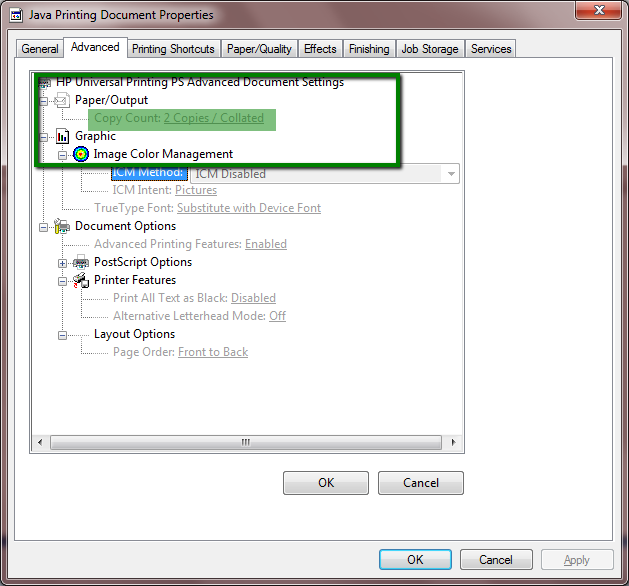 Printing can be done by using the DocPrintJob, FileInputStream and Doc objects. First is to create a FileInputStream based on the file that I want to print. Next step is to create a Doc object based on the FileInputStream. Finally create a PrintJob based on the Doc object. I also show the user a message when something goes wrong. All this functionality is implemented in an actionListener behind a command button. The code for the page fragment is simple. 2:     <af:commandToolbarButton text="Reset to Default"
And the page now has a print button. When the print button is pushed, the document is sent directly to the printer. It is also possible to set job properties such as number of copies, the orientation of the print, and many other properties. I can check the result of this in the print properties of the printjob. Now one last thing to do is to give the printjob a decent name. As you can see, by default, all jobs have the same name, and that has no relation whatsoever with the document name, neither can it be related to a user or client. I want to use a jobname that is more descriptive. I can do that by adding the JobName to the PrintRequestAttributeSet. Printing can be done directly from within the ADF Application. You can use almost any of the properties that can be used in the printer dialog of your browser or operating system. This example can be extended and I will probably create an ADF taskflow library to deploy this functionality. You can request a copy of the workspace by emailing me at lucbors at gmail dot com. OR you can download the workspace here. Thanks Wilfred. I adjusted the post. Client is gone where it might raise the wrong suggestion. Amazing post..ADF 11G printing is really amazing..Its mind blowing..Thanks for telling about 3D printing. I am a beginner in ADF and have been trying your excellent post on ADF: Print Directly from your Application. Can you please send me the workspace please ? with custom tagsassociated to information from de Oracle DB. I think part of your example will help us to handle the selection of the printer. Could you share your workspace ? Any hint about working around this requirement would be appreciated. used the pdf format, but it is a slow process. and I would like to request the workspace you used for the sample, right know I'm working on something related with direct printing and your post really helps me. I'm having troubles when the application is deployed in an i-frame in other adf application. Hi, This is a very good article. In this article, you are printing files present on the hard drive. I have a requirement to print the data shown on the web page using an ADF read-only table. How can I print this data. Hi Naeem, you can use showprintablepageBehavior tag for that. Hi.... good post.. Helped me a lot.. but is there any possibility to pass a query and query result printed. suggest me a link..
neither am i getting any error. I tried running you application, but I couldn't print the document. Is there any extra configuration I need to do for printing to work from Application ?